While the kids and my husband had fun at the children's museum on Sunday, I stayed home and painted the stairs. First, I filled in all the holes where a runner had been nailed in, with wood filler and let that dry before a light sanding. Then I primed and painted (2 coats). The treads had already been stained by my husband when he did the floors. We chose a combination of 2 parts Minwax Jacobean and 1 part Minwax ebony and topped it off with 2 coats of oil based Polyurethane. The risers, trim and balusters were looking pretty dingy, so it feels great to have them looking all sparkling white. Now the only problem is that the trim in the rest of the house is a different color. I knew that when I picked out my paint color, but now I'm not so sure I want to go through the hassle of painting all the other trim white (it's a cream color now). I know, eventually, I won't be able to stand my two-toned trim and I'll get to painting. 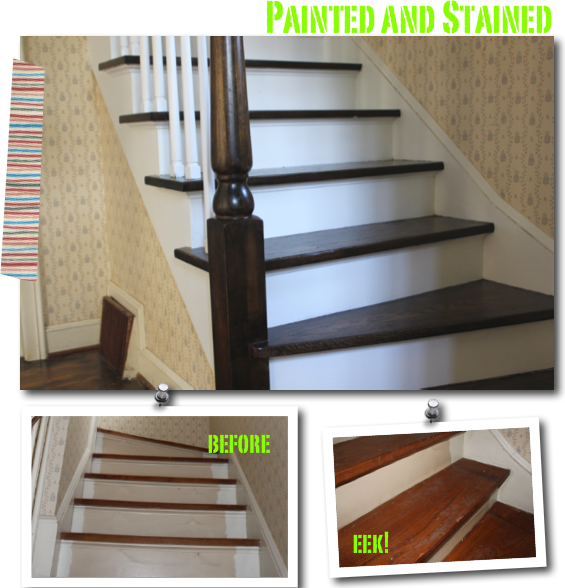 I played it safe with a pretty traditional combination of dark stain and white paint, but I did consider something more bold like this fun staircase designed on Home by Novogratz on HGTV. (How thrilled am I that the daring design duo is back on TV!!!) This would be fun in the basement, wouldn't it? And then I considered some stencil action, but just like I could never decide on a tattoo design, I can't decide on a message. What do I want my stairs to say? "Come On Up," "Watch Your Step," "Bathroom's On Left." Maybe something spiritual? Poetic? 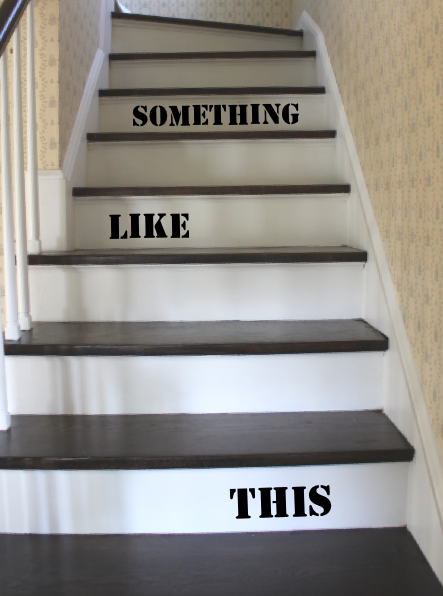 So for now my stairs will just have to be simple and maybe in a few years when I've run out of D.I.Y. projects, I'll whip out some paint and do something wild. 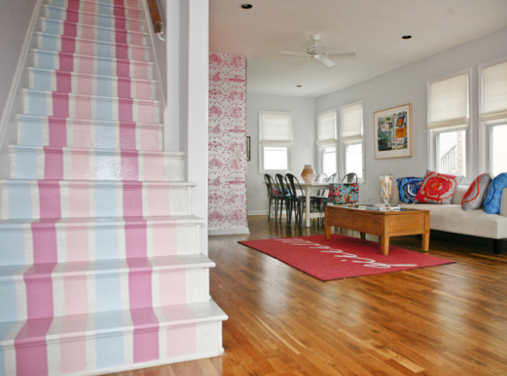 Pink and blue painted staircase photo via HGTV. Others my own.